With fragrant flowers and a vigorous growth habit the Firecracker Honeysuckle makes a good choice for covering up fences and outbuildings. The flowers of this hybrid plant are large and spidery, a mixture of red, pink and golden yellow. Although this is a climbing plant, it can also be trained and pruned into a small bushy shrub. Try growing this free flowering plant amongst other climbing plants that flower at different times of the year. 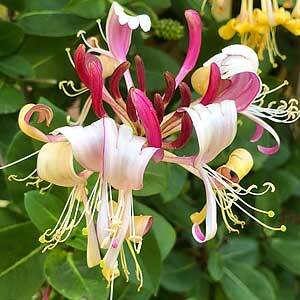 You can also train Lonicera x heckrottii along a fence and prune it to make a flowering hedge. Best in a humus rich well drained soil, the Firecracker Honeysuckle will reach 3 to 5 metres in height unless pruned. Choose a position where the root system is in part shade and the plant itself can grow into the sun. It is a plant that will grow in shade, lower flowering may be limited in deep shade. Once established this is a reasonably drought tolerant plant and it is a less aggressive in growth habit than some others. Flowers – Large spidery Red Ping and Gold, fragrant.